Scientists have developed a novel approach that boosts the chances of finding extraterrestrial intelligence in our galaxy. The method uses probability theory to calculate the possibility of detecting an extraterrestrial signal (if there is one) at a given distance from Earth. 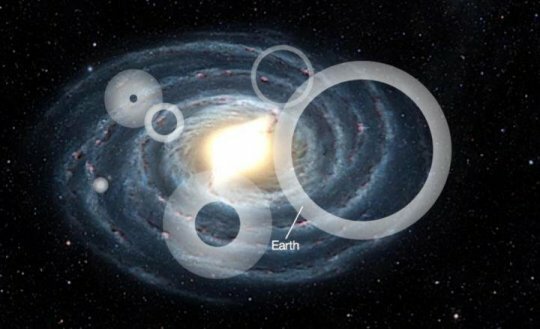 Schematic view of the Milky Way showing six isotropic extraterrestrial emission processes forming spherical shells filled by radio signals. The outer radii of the spherical shells are proportional to the time at which the signals were first emitted, while the thicknesses are proportional to the duration of the emissions. In this example, the Earth is illuminated by one of these signals. Could there be another planet out there with a society at the same stage of technological advancement as ours? To help find out, EPFL scientist Claudio Grimaldi, working in association with the University of California, Berkeley, has developed a statistical model that gives researchers a new tool in the search for the kind of signals that an extraterrestrial society might emit. His method -- described in an article appearing today in Proceedings of the National Academy of Sciences -- could also make the search cheaper and more efficient. Atrophysics initially wasn't Grimaldi's thing; he was interested more in the physics of condensed matter. Working at EPFL's Laboratory of Physics of Complex Matter, his research involved calculating the probabilities of carbon nanotubes exchanging electrons. But then he wondered: if the nanotubes were stars and the electrons were signals generated by extraterrestrial societies, could we calculate the probability of detecting those signals more accurately? This is not pie-in-the-sky research -- scientists have been studying this possibility for nearly 60 years. Several research projects concerning the search for extraterrestrial intelligence (SETI) have been launched since the late 1950s, mainly in the United States. The idea is that an advanced civilization on another planet could be generating electromagnetic signals, and scientists on Earth might be able to pick up those signals using the latest high-performance radio telescopes. Renewed interest Despite considerable advances in radio astronomy and the increase in computing power since then, none of those projects has led to anything concrete. Some signals without identifiable origin have well been recorded, like the Wow! signal in 1977, but none of them has been repeated or seems credible enough to be attributable to alien life. But that doesn't mean scientists have given up. On the contrary, SETI has seen renewed interest following the discovery of the many exoplanets orbiting the billions of suns in our galaxy. Researchers have designed sophisticated new instruments -- like the Square Kilometre Array, a giant radio telescope being built in South Africa and Australia with a total collecting area of one square kilometer -- that could pave the way to promising breakthroughs. And Russian entrepreneur Yuri Milner recently announced an ambitious program called Breakthrough Listen, which aims to cover 10 times more sky than previous searches and scan a much wider band of frequencies. Milner intends to fund his initiative with 100 million dollars over 10 years. "In reality, expanding the search to these magnitudes only increases our chances of finding something by very little. And if we still don't detect any signals, we can't necessarily conclude with much more certainty that there is no life out there," says Grimaldi. Still a ways to go The advantage of Grimaldi's statistical model is that it lets scientists interpret both the success and failure to detect signals at varying distances from Earth. His model employs Bayes' theorem to calculate the remaining probability of detecting a signal within a given radius around our planet. For example, even if no signal is detected within a radius of 1,000 light years, there is still an over 10% chance that Earth is within range of hundreds of similar signals from elsewhere in the galaxy, but that our radio telescopes are currently not powerful enough to detect them. However, that probability rises to nearly 100% if even just one signal is detected within the 1,000-light-year radius. In that case, we could be almost certain that our galaxy is full of alien life. After factoring in other parameters like the size of the galaxy and how closely packed its stars are, Grimaldi estimates that the probability of detecting a signal becomes very slight only at a radius of 40,000 light years. In other words, if no signals are detected at this distance from Earth, we could reasonably conclude that no other civilization at the same level of technological development as ours is detectable in the galaxy. But so far, scientists have been able to search for signals within a radius of "just" 40 light years.